Let me just say that even though I graduated from the University of Utah I've never before been to a Utes football game. Yep, that's right, I was never one of those students who had a ton of school spirit. I spent most of my time with my nose buried in a book and because I was extremely shy and studious I didn't really have a typical college experience. That being said, my husband has always wanted to go to a Utes game. Unfortunately, tickets are quite pricey, even for illustrious alumni. Since it was our anniversary this month I really wanted to do something special for my husband. I heard about TickPick and thought I would give it a try. Essentially TickPick is a website that sells all types of events tickets without paying any sort of convenience fees. I find TickPick to be most helpful for tickets to sold out events or hard to get tickets. 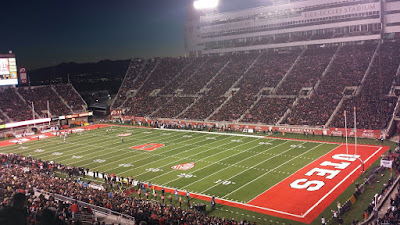 There are tons of Utes season ticket holders who can't make it to every game and TickPick would be a place to find tickets that fill up those seats without paying full price so it's a win-win. The only thing I found slightly disappointing was the high shipping fee. Granted, tickets are shipped FedEx and super fast to ensure you get your tickets on time, but just keep in mind that additional fee. Otherwise I was super happy with the tickets we found for a great deal and since my husband is quite into music and sporting events it's definitely nice not to pay all the convenience fees! 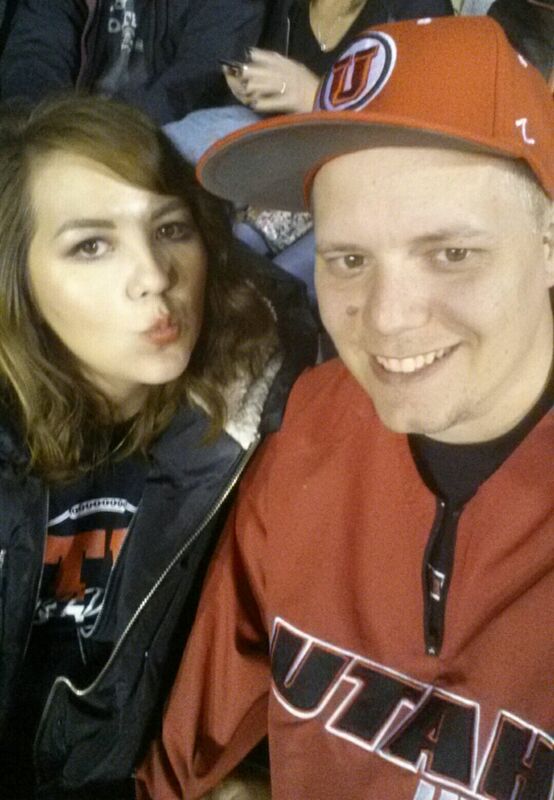 I was elated that we'd finally get to be able to go to a Utes game! I'd definitely recommend using TickPick if you like music/sports/state fairs or any other number of events. They're definitely worth it to people who go to lots of events! The marching band forming a "U"
Our defense working hard to keep the enemy (Oregon State) out. 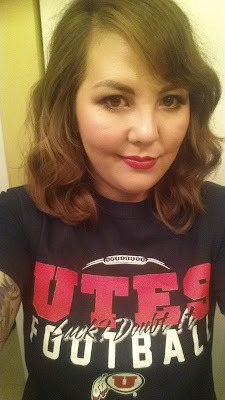 Me and the hubs showed our Utes pride in all our gear. I am happy we were able to finally get to a Utes game; from the snacks, to the energy, to doing the wave, it was a great time and our team won 27 to 12! We are definitely planning on going to more games soon! I hope everyone had a great Halloween weekend, let me know what you did in the comments! Awesome! I was never into sports too much while at university either, but they're growing on me now. Happy November lovely! You guys look adorable in your football gear! Looks like a great game and I'm glad you had a good time! I hope your week is off to great start gorgeous girl! I'm so happy you had a lovely time ! You look really pretty in the picture by the way, your hair is lovely curled :) This weekend me and my boyfriend went to see a massive firework show at a theme park and it was amazing! Look at you two cuties!!! That's so exciting you got to see them play, yeah ya for them winning!!! You guys over in America are really into Football ay? TickPick sounds soooo good, it's crazy how expensive tickets to things are! =/ The New Zealand version to football is rugby *I think* and well I kind of didn't really pay much attention to it *would totally be disowned if New Zealand people read this lol* but there has just been the rugby world cup and New Zealand won so everyone's been going crazy over here for it XD Hope you are having a gorgeous day you badass angel!